description for "Winter Squash and Pumpkins: Cucurbita pepo, 'Small Sugar'"
Cucurbita pepo 'Small Sugar' produces high quality stringless, thick, sweet flesh in a 5-8 lb. pumpkin. Came from selections started in the 1800's. 'Small Sugar' pumpkins make delicious pies. Dependable and easy to grow. Lightly ribbed. Planting depth: .5-1 inch. Days to germination: 3-7 days. 100 days to maturity. 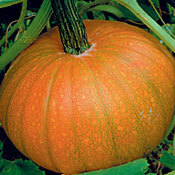 reviews for "Winter Squash and Pumpkins: Cucurbita pepo, 'Small Sugar'"